Der Sieger ist Chris VanMeter mit G/R Aggro. Herzlichen Gl�ckwunsch! Der Sieger ist David Melendez mit Jeskai Stoneblade. Herzlichen Gl�ckwunsch! Der Sieger ist James Harrod mit Affinity. Herzlichen Gl�ckwunsch! An beiden Tagen wird die Coverage von einer Live-Video-Coverage begleitet. Die Kommentatoren sind Patrick Sullivan & Cedric Phillips. 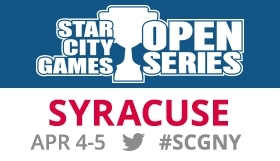 F�r weitere Infos siehe das SCG OS Syracuse 2015 Fact Sheet. All your Magic are belong to Pooh Bear. [+] All your Magic are belong to Pooh Bear. Angel. �Artist proof sketch of the Black Thumb variety. [+]Angel. �Artist proof sketch of the Black Thumb variety. Can a split card have an instant on one side, and a sorcery on the other? I think it would work, aside from fuse not working half the time. [+]Is there a�?Design a Ridiculous Split Card? contest going on that I?m unaware of?We could do this, but not with fuse. [+]No. You can?t have unaccounted for variables running around. [+]I say boxing is a sport, so I don?t hold too fast to the�?no judges? interpretation. [+]No, because the other half by itself would have a meaningless X. Just wanted to make sure this is right. Tarmogoyf is a 2/3 due to instant and sorcery in the yard. It gets hit with reduce in stature and is a 0/2. Someone cracks a fetch. 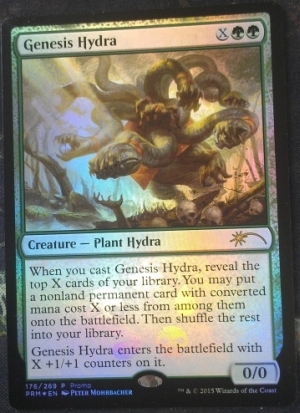 Does goyf now become a 1/3? [+]No, it?s an 0/2. Reduce in Stature overrides. A new card type appearing in the graveyard doesn?t make Tarmogoyf?s p/t-defining ability reapply or something. Would you ever use a semi-colon to divide Flash from the other keywords if you needed to save a line? What do you think Mark's entrance music should be in your rules manager unification match? [+]The Roseanne theme song, presumably. Having some trouble with layers here, Mirror Entity sets Base Power and Toughness correct? In your answer to "canadianguyofwrath", thankyou thankyou thankyou for calling it "hockey" instead of "ice hockey". Signed, a fan of wood basketball and grass football. [+]It?s probably only necessary to say ice hockey when you?re purposefully differentiating it from field hockey, right? I think the ice game is the presumptive default. What is your opinion of ultimate taser ball? And yes it is a real thing. [+]What the hell? I?m? what the hell? What's more likely: a split card with fuse and both halves have X in their mana costs, or one where one half has X and the other Y? Is there a quick, easy way to explain layers? [+]Not really, but there?s this: given all the continuous effects affecting an object, what do you think that object is. If the layers are set up correctly, you?re correct most of the time. If you were helping Richard Garfield print Proposal today, would you Rules Manager it to be "Soulbond both players"? [+]I?d print whatever Richard wanted to print and hope he gave me one. Since you've taken over as rules manager, what new mechanic has been the most difficult for you to manage? [+]Double-faced cards probably required more work than any other mechanic thus far. Could you do Who/What/When/Where/Why in black border as a modal spell? Would Who/What/When/Where/Why type of card work in black border? [+]Sure. I mean, you wouldn?t want to do anything foolish like make it a modal spell. [+]agentpalmer: Back in 1997, two of my worlds collided, when Wizards of the Coast and MicroProse came together to release Magic the Gathering: Duel of The Planeswalkers, also known as Shandalar.Read more? Retro cool ! [+]It was only a short time ago that R/W Aggro was one of the best decks in Standard. GerryT provides the template to revive the falling archetype at #SCGStates! [+]This is a StarCityGames.com Premium Article. Click here to sign up.Todd Anderson can't make the Pro Tour this time around, but that just means he has nothing to hide! See what he thinks the best five cards in Standard are before #SCGStates! [+]Danny West returns with his thoughts on having a brand new format at The Invitational, some new Legacy tech, and of course, the Commander rules change! [+]This is a StarCityGames.com Premium Article. Click here to sign up.One of the most influential deckbuilders on the planet takes a quick reprieve from Pro Tour testing to drop off some of his latest amazing lists for your #SCGStates consideration! [+]You read that correctly. We've got a brew in the making, and it could be a great way to have a great time while surprising the field at #SCGStates this weekend! [+]CVM added yet another trophy to his impressive and growing collection! You can't get better advice on his latest masterwork anywhere! Read up before #SCGStates! Damn it tumblr stop moving stuff!!! [+]Damn it tumblr stop moving stuff!!! Long time lurker here. Mark do you know any cards that were designed after political movements? Do you know how many people listen to DtW? [+]I actually do not. It is usually close to ?Limited Resources? on iTunes and they have tens of thousands of listeners. I'm working on a custom set with an artifact theme, and have hit a stumbling block: How does black care about artifacts? [+]Black will use whatever tools necessary to accomplish its task so it embraces technology as number two after Blue. Could djinns work as whites characteristic race? Would you ever create red vampires on other planes or is that something unique to Innistrad? [+]It?s something we could consider but there would have to be a strong reason as I like it being an Innistrad thing. [+]I know the answer for some of the slang but not all of it. Trix, for example, I know, (Extended combo decks starting getting named after breakfast cereals after Fruity Pebbles got popular) but have a less clear idea about Junk. Let's do a poll. What do you'll think MaRo's rapper name would be? [+]Okay, Question Marks, have at it. Could any of those cards you made for Duplicate Limited formats at the Invitational eventually see print in regular sets or supplemental products? [+]Unlikely as the rule was I had to make cards I thought we would never make in normal Magic. I did a lot of mixing and matching of keyword mechanics. When are we going to finally see an arachnid that comes into play tapped? You can call it the ETBT Spider! Have you ever considered having more than one characteristic race for each color? [+]The goal is to have one for players to identify with. Having too many pulls focus. That said, Black has two. Would it be possible for the Izzet to be more artifact focused in a possible Ravnica 3, or are they too closely tied to being the Instants/Sorceries guild? [+]The problem is a heavy multicolor set, like any set based in Ravnica, doesn?t have much space for artifacts. We have a color without a truly befitting iconic, and a creature type that fits a different color. Is it the Bees' time to shine? [+]I think some of you miss what an iconic creature is. Hydras, by the way, are doing fine. could you create a list for a more current "duplicate limited" so that we can run one ourselves, or does that take too much time to balance? [+]A Duplicate Limited card pool, a good one at least, takes a while to put together and usually involves some playtesting. Why can't green iconic be snakes? [+]Iconic creatures are infrequent and usually very impressive. I don?t think snakes fit the requirement. [+]I call them the characteristic creatures. And yes, Magic has them. White: Human (one day we?ll get another one) Blue: Merfolk Black: Vampires or Zombies Red: Goblins Green: Elves Characteristic races appear in larger number and at lower rarities than iconic creatures. I'm interested in the Japanese Ghave you posted. What kind of price are you looking for? [+]30 Days of Character Outfit Challenge: Day1. Casual(I don?t know I?ll post art everyday tho? )Quicksilver from All-New X-Factor, I really miss Serval Issue outfit so much. Frage (17078): Was ist Kreaturenschaden, z. B. beim Hitzestrahl (Heat Ray)? Frage (17077): Ich opfere f�r die F�higkeit meines Eingeweidelesers (Viscera Seer) einen Jeskai-Weisen (Jeskai Sage). Ziehe ich zuerst eine Karte und f�hre dann Hellsicht 1 durch, oder umgekehrt? Frage (17072): Es ist meine Kampfphase. Wann kann ich sp�testens Die Herausforderung annehmen (Rise to the Challenge) wirken? Frage (17071): Bekomme ich 2 Lebenspunkte, wenn ich das Hochlandwild (Highland Game) f�r etwas anderes opfere? [+]wizardsmagic: markrosewater:?Tales from the Pit? #1003 Why indeed, Mark. Why indeed? [+]Here?s the video to go with the article that was posted yesterday in regards to where you can sell Magic cards! It?s the same thing in video version so you can get a bit of an idea what the eBay and TCG Player interfaces look like for sellers.No idea why I recorded it with chrome like half width?. [+]Opening a pack with an extra rare would be nice, but turns out its even better when you?re opening a Beta Starter? The Noble Troll: Rakdos Is Back! [+]Much to his own surprise, Frank tackles yet another Rally the Ancestors deck, this time one utilizing Purphoros, God of the Forge and Assault Formation! Is the deck perfect for this weekend's TCGplayer MaxPoint Open 5k in Orlando, FL? [+]Cassidy revisit one of his favorite Commander decks of all time, geared for the French format: Karador, Ghost Chieftain. Inside he'll go over the changes he suggests making to a successful 100 card build. DTK Swiss #2 Aufgabe: Erfahrung sammeln. How many responses is a ton of responses? The Eh Team #223 - How Many Dragons? [+] softmonkeychains:reiburadori:Cool Breeze said, ?Watch for the hook? ? in this case, that?s the plot twist. ?Let?s Battle? by firehorse6�(January 24, 2013)?No wonder humans love to play trainer. That was fun :3? The assistant couldn't keep the smile off his face as he made his way to the door, taking a moment to lightly rap on the door before stepping back. Where to sell Magic cards?